I usually don’t do any prerelease testing. Mostly that’s because manufacturers will send one prerelease copy to a reviewer. If you tell them you won’t test less than ten copies they look at you like, well, I don’t know what they look at you like because I only communicate by email. But they say nope; you can’t have ten. And I usually (unless I’m really, really interested, which is rare) just decide to wait until it is released. The other reason I don’t often do prerelease testing is that there’s some gamesmanship about prerelease copies, especially if you’re not a giant review site. I’d rather just review ten purchased copies after release than play games. With that in mind, I want to practice full disclosure about these ten copies. They are prerelease copies owned by Sony; not by Lensrentals. Sometimes we get the opportunity to test them for Sony before they’re released. I give them the data, make my comments, and keep my mouth shut for a while (because there is, of course, a keep-my-mouth-shut clause in our agreement). Then I wait six weeks until Lensrentals gets copies, test ten of those, and write a blog post. 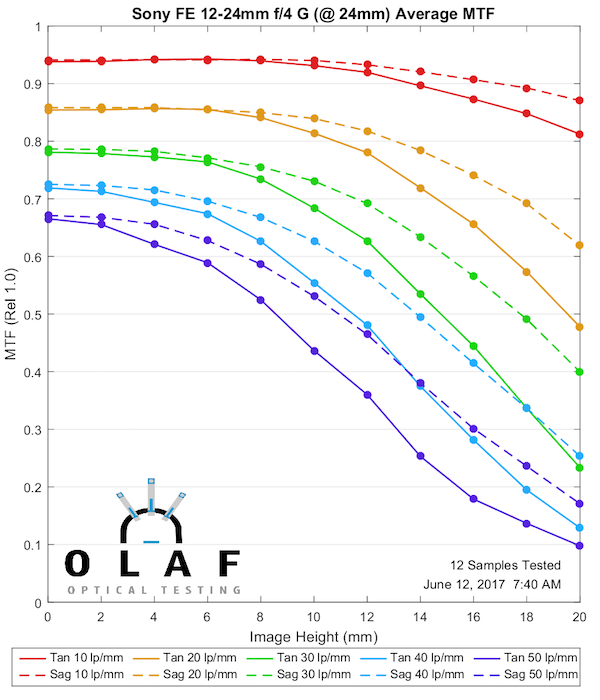 In this case, because the lens tested really well, I asked permission to go ahead and do the write-up based on the tests of their copies, which they granted. If it had sucked, I wouldn’t have asked. So there, now you don’t have to read the article because I already told you it’s good. Oh, and because someone is going to scream ‘those are hand picked copies,’ trust me, if most manufacturers could hand-pick half as well as you think they can, there wouldn’t be any reason for us to test them, would there? I’ve been doing this for years, and so far, I’ve never seen a big optical difference between pre-release copies and off-the-shelf copies. 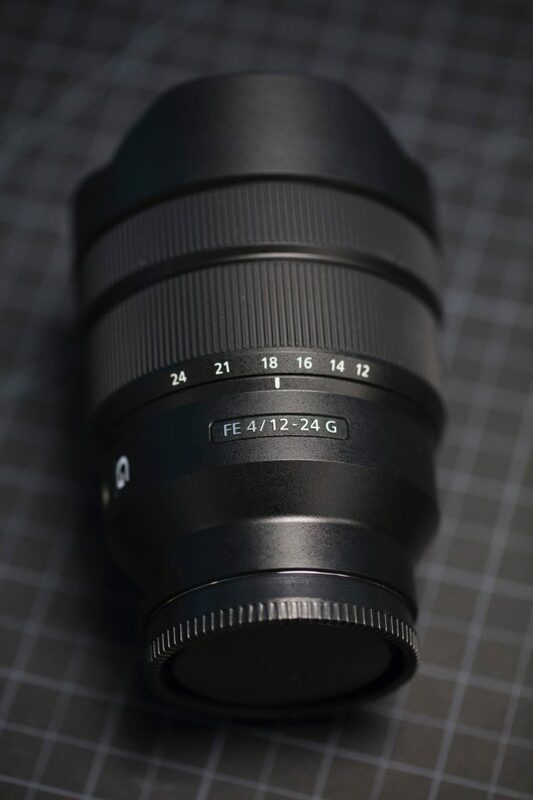 The Sony FE 12-24mm f/4 is a full-frame, ultra-wide angle zoom that will be available in August for about $1700. It has Sony’s ‘Direct Drive Supersonic Wave Motor,’ which is a linear piezo drive, like the one in the Sony FE 85mm f/1.4 GM lens. It has four aspheric elements, a curved aperture ring, yada, yada. Most impressive to me is it’s a reasonably small lens, around 4.5 inches long and weighing about 1.25 pounds (565 grams for those of you who have a logical measuring system). 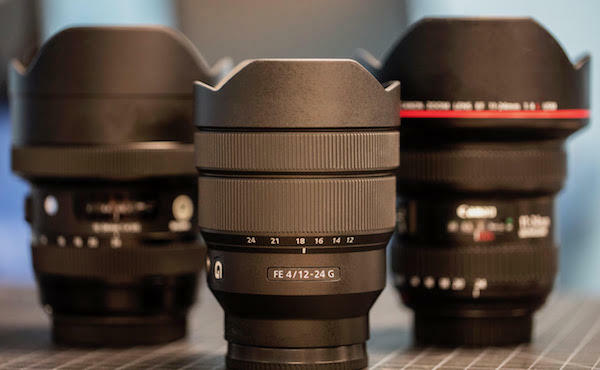 That’s a full pound lighter than the Sigma 12-24mm f/4 Art and Canon 11-24mm f/4 L lenses that I waxed poetic about in an earlier post. And Sony’s price is just a few hundred more than the Sigma and about $1,000 less than the Canon. Let that soak in for a second. This is a Sony lens, that is not more expensive than the competition. It’s almost July. I’m looking for snow. As always, these are the averaged results of ten copies, each tested at 4 different rotations. 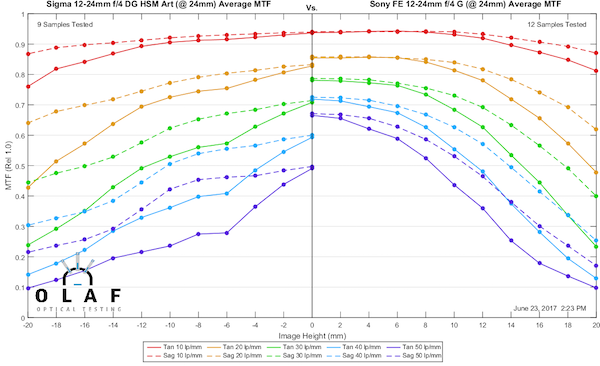 Because of the baffle used in the Sony mount there are fewer points to average at 18mm and 20mm away from center, so take those edge measurements with a tiny grain of salt. This is really very good. I was a bit surprised after I first picked up the lenses, which are tiny compared to the Sigma 12-24mm f/4 or Canon 11-24mm f/4, that the results would be this good. The 24mm results follow Roger’s Rule of Wide Zooms; the long end isn’t quite as good as the wide end. But that’s as it should be, we don’t buy 12-24 zooms to shoot at 24mm most of the time. And honestly, it’s still quite good even at 24mm. We actually do have a variation number finally set up and approved. But until we’ve recalculated it for 500 lenses, I won’t be presenting it. 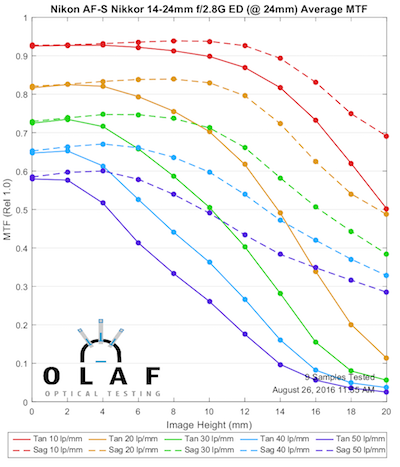 I will show you our standard variance graph that basically shows you the range of these lenses. It’s better than average. Sony seems to be making progress with their sample variation in the newer designs. Especially at 12mm, there is almost no variation in the center. As with most wide-angle zooms, if your copy isn’t quite like the others it will probably be at the long end, but this is really a good performance. 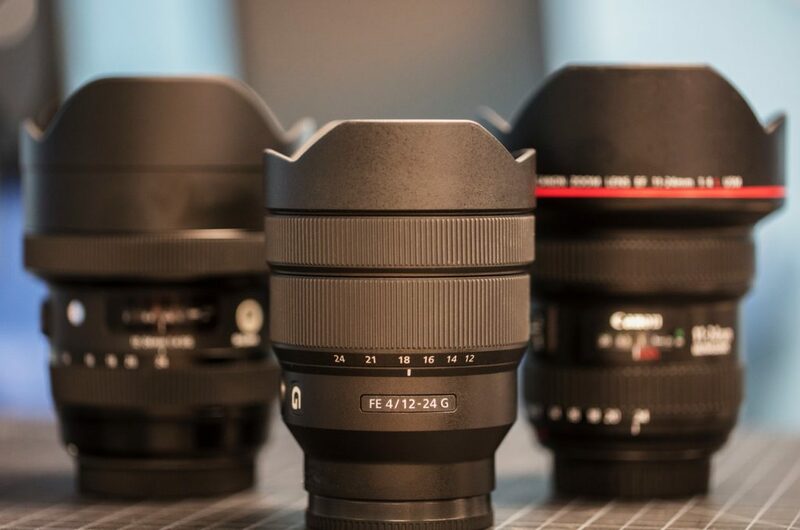 It seemed to me the logical comparison was with the Sigma 12-24mm f/4 Art. 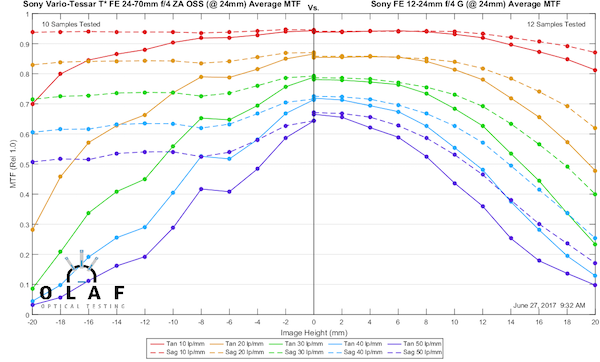 I’m sure some fanboys will find some hair-splitting here at 12mm, but whatever differences are insignificant. At 24mm the Sigma isn’t keeping up with the Sony anymore. The Sony is clearly better both in the center and all the way to the edge. There aren’t a ton of other logical comparisons to make, but I’ll throw a couple up. There is a real difference between 11mm and 12mm, but still an interesting comparison. And no, I’m not commenting other than ‘those are both excellent’. This is actually a useful comparison because I think people will carry both of these in their bag and may want to choose which to use at times. This is somewhat surprising to me, as usually the short end of the longer zoom will be better than the long end of the shorter zoom. Not true this time. This was a test of the MTF of a new lens. It was not a lens review. Had it been an actual lens review you would have been instructed which lens to buy via a handy click link at the bottom of the post. It was simply an MTF test. There are lots of other things that go into selecting a wide angle lens; flare resistance, autofocus accuracy, reliability, how it handles, etc. 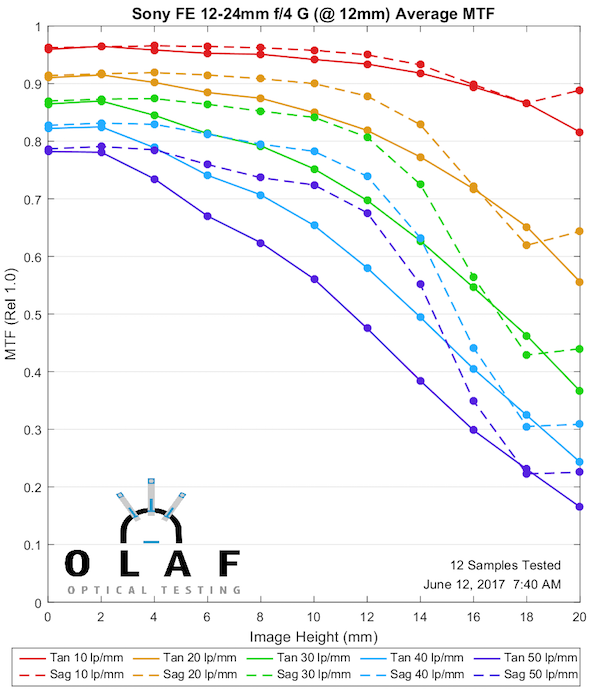 The MTF results tell you if the lens should be a sharp lens, and the results here indicate that it should. That makes it worth further investigation for those of you interested in this focal length. 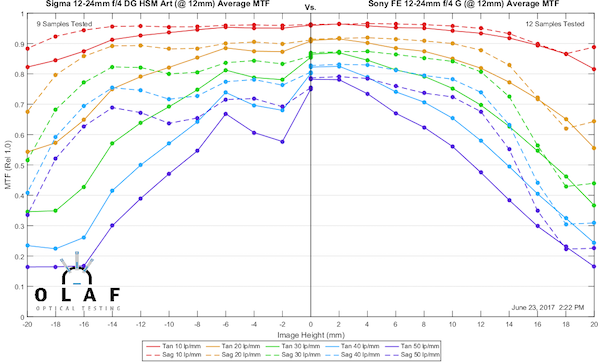 It’s one of the more impressive Sony offerings that have come out; reasonable price, excellent MTF, reasonable sample variation. There is something that is more interesting to me in the bigger picture, though. Sony has made this lens smaller than the others in this range, which will be nice sitting on an FE camera. And they’ve done that without the customary ‘Sony surcharge’, which is nice on your wallet. At this point, I can’t help but be very impressed. 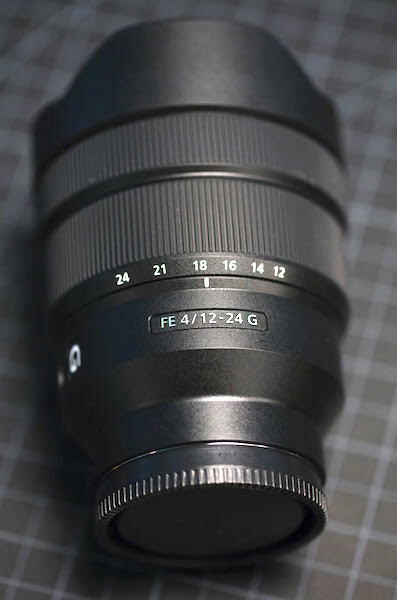 Several people have asked about the field curvature of this lens, so I’ve posted the field of focus at 12mm and 24mm. Both are really flat at infinity, most impressive. How is the distrotion for Real estate photography? Sorry Jimmy, but the imperial system is stupid and outdated and needs to go. If it gives you a warm fuzzy feeling then go for it but the rest of the world has moved on. We don’t stock enough for me to test 10 copies. And I won’t even consider testing less than 10 copies. I like what I’ve seen from Venus Laowa, but my experience with similar lenses has been that copy-to-copy variation is massive. If we ever get enough demand to stock 10 of them, then I will. These are great posts, but ultimate hard for me to interpret because I never use a lens like this wide open. A big maximum aperture is a convenience for focussing, and for framing in low light. But a wide zoom is something I use for architecture / interior kinds of photographs (or could imagine using for landscapes). These have so much depth of field at all apertures that selective focus isn’t usually much of an option anyway, so unless you’re doing macro stuff everything’s going to be more or less in focus. So it usually makes sense to stop the thing down to the sharpest aperture for the situation. 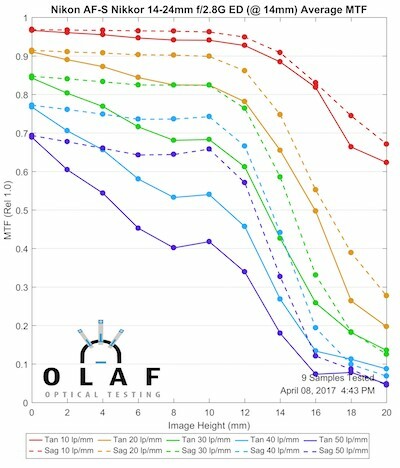 I realize that an MTF chart at full aperture tells us some things about how well-corrected the lens is overall. But the correlation between wide open performance and stopped-down performance is never absolute. And it’s extremely iffy to compare lenses at maximum aperture when they have very different maximum apertures. So many variables, and possibly different design priorities. 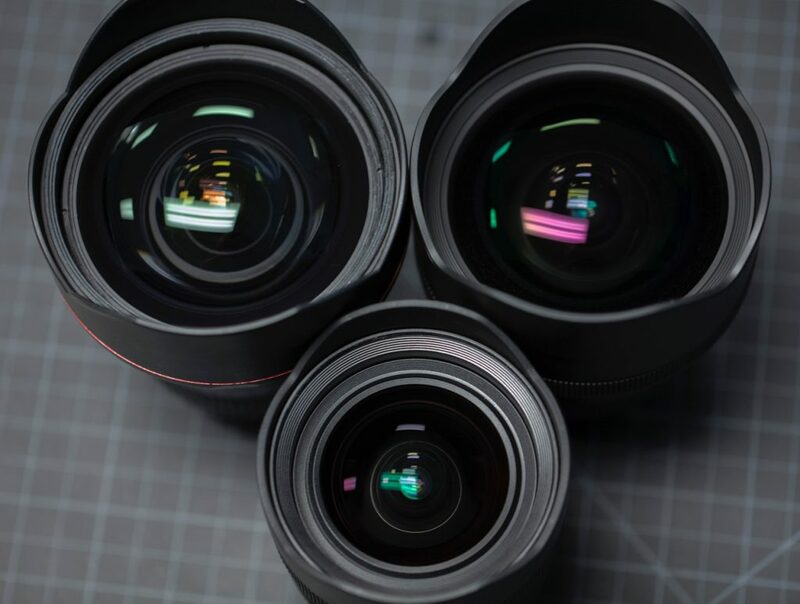 I’d find it much more instructive to see these lenses compared at f5.6 or f8. 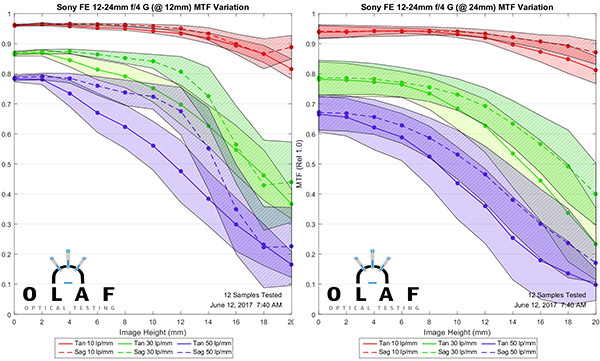 Do you happen to have the Full Field MTF Patterns/Displays for the Sony 12-24mm? I found the ones you posted in the 16-35GM blog post very helpful. Thanks! I think the tolerance is much tighter for ultra-wides. I’ve used three adapters, manual or AF. Correcting distortion in software will reduce the MTF at high frequencies. Low frequencies will more or less make it through unchanged. Hi great information 🙂 but what about ND filter for videographers? In day to day life situations the old customary system (feet, pounds, gallons) is considerably more sophisticated than metric. Metric is more useful for precise science etc as divisions by 10,000 mm etc or whatever is easier. But for baking a cake, buying vegetables, joinery, calculating mileage of a car etc the old way is better as it is based around the units rather than the relationship between units. It’s the same as measuring time. Days with 24 hours and 365 1/4 days per year are “illogical” but give nice easy to use measurements – if I say I will see you next Thursday at 8pm you know what that means even though a minute has 60 seconds and a day 24 hours etc and you would struggle to calculate how many minutes away that is. If I said I will see you in 340 kilo seconds or whatever it would be absurd. That’s why when given a free choice – as happened in Britain for much of the 20th century and in most case the USA to this day, free people will choose a mixture that is mainly based on customary units. For measuring focal lengths millimetres are a useful standard but for measuring vegetables for a recipe the cutomary units are far more sophisticated giving nice figures of 4 or 12 that can be divided easily – most metric measurements end up calling for 450g of this and cut these 100mm etc – quite strange measurements – but 1lb and 4 inches are far better for a human being to use having been refined over many centuries. how is barrel distortion? compared to alternatives like Canon/Sigma? if barrel distortion is corrected in-camera, it would apply to RAW as well as JPEGs? if barrel distortion is done in post, does it improve or worsen MTF results? I have also adapted my 14-24 to my Sony cameras. Trust me the performance with an adapter is much worse than on an original Nikon body, especially near 14mm 2.8 where it should’ve been quite stellar. Any mechanical error of the adapter is at its worst when you put a fast ultra-wide on it. The Nikon should be up as an addendum to the article now. Thanks Roger, everything here is amazing and I appreciate your good judgement all around. In truth, I have the 14-24mm and use it on an A7r with an adapater, and it’s really sharp etc. But it’s also an awkward object to hold! So if the Sony can match the performance, it would be great. I get the wide open problem. Good point. I don’t think many people are choosing whether to buy a Sony 12-24 or Nikon 14-24, no. There may be a few that are deciding which system to go with for wide-angle, but that really requires a system (camera and lens) test for comparison, and our tests are just lenses. 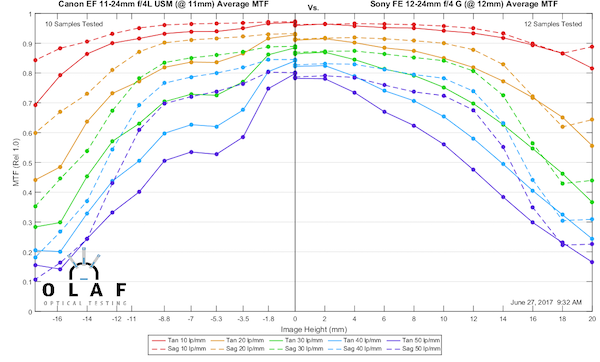 And since we test wide open, he MTF will compare the Sony at f/4 to the Nikon at f/2.8 so that’s not very similar, either. I do think a lot of Fanboys want to pound chests about whichever is better and it bothers me a lot when people use our tests to do that, so I tend not to make those comparisons. However, I could be wrong and there may be a ton of people who are considering whether they’d rather shoot the 14-24 f/2.8 Nikon on an adapter as an alternative to the f/4 Sony.